In this article, we will be going through the details about Apttus and at the same time, we will explore the internals of the tool altogether. This is how we have organized the whole article to provide the best about Apttus. What is the role of Apttus in Salesforce? Apttus, in simple words, is a quote-to-cash software provider that drives important business processes between a potential buyer’s purchase and the revenue realization. It is also the Organization dealing with leading Configure Price Quote (CPQ) software, E-commerce, and Contract Management software. Enthusiastic about exploring the skill set of Apttus? Then, have a look at the Apttus Training together additional knowledge. Apttus CPQ (Configure Price Quote) is the sales tool from the Apttus line of product offerings which are designed to serve the sole purpose of providing reliable and accurate quotes in real-time. This not only helps the companies to gain this information but also enables Sales teams with cross-sells. With Apttus CPQ tool, organizations gain better leads into their newer sales, and cross-sells and sale cycles are quadrupled as well. Salesforce CPQ is an offering from the Salesforce end, which is for organizations to provide the most accurate and reliable price quotes, given the required information, such as the product configuration. These applications take into consideration many factors like discounts, features, quantities, customization etc and then provides quote prices precisely quick and accurate. As Salesforce has its own Cloud offering, the tool can be used on-premise or on the cloud (just as the need demands). Apttus Omni is built atop of Salesforce, which is one of the most scalable and most secure platform clouds. It means that Apttus Quote-to-Cash (QTC) tool already inherits most of the amazing features that Salesforce has to provide for its customer base, such as the ability to run businesses with multiple languages and currencies, mobile access and last but not the least, analytics. Apttus CPQ, as discussed earlier, is an innovative CPQ offering from the Apttus line of offerings, which is powered by undying artificial intelligence. Salesforce CPQ, on the other hand, is fully native and built on all features of Salesforce which not only automates quote generation but also the order and contract processes. Pricing Has a flexible pricing strategy with Apttus CPQ. Provides more discounts than that of Salesforce CPQ. Pricing strategy is not better than that of Apttus CPA. Doesn’t provide as many discounts as that of Apttus CPQ. Configure Price Quote (CPQ) is the term that gets used pretty much in the Business to Business (B2B) industry which in turn describes tools that help sellers quote configurable products that are complex in nature. 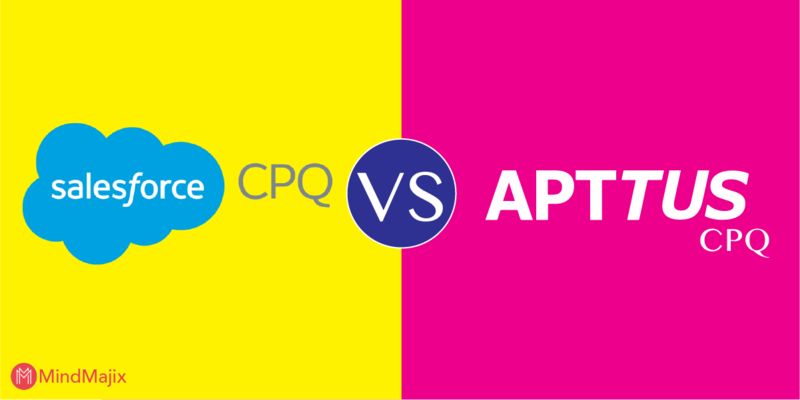 As discussed earlier, either the Apttus CPQ or the Salesforce CPQ software tools help companies to precisely define good prices across a plethora of changing variables. It could be understood as the tool that helps determine the price of the whole product based on what gets selected finally for the actual product configuration. Vodafone postpaid with 399 plan plus 20GB extra data which costs 49, finally costs 448/- to the customer. Custom Settings will be required to be updated, especially the “Instance URL” when all the required packages are installed successfully. Then, these additional configurations would be saved as part of the Custom Settings. This would be available for you to access, update from the tool itself as all of these are post-installation configuration. To set the “Instance URL”, you will have to go through the Custom Settings tab on the tool. A business rule is considered to be a Constraint rule in the world of Apttus CPQ software tool. These are nothing but rules that let you exclude, include, recommend, validate, and replace products based on certain business logic. These are header level objects that have a certain condition linked with a certain action. These can be better understood as the control statements in any of the programming languages that we come across. These have three parts, and they are mentioned below. Rule Condition - This is more like the “if” part of your business rule, and lets you define it. Rule Action - This is the action that needs to be implemented if the above rule condition is met successfully. Apttus’ X-Author for CPQ is a tool that is Excel-based to provide the quote applications for the Apttus CPQ tool as such. Users can have the luxury of being within an excel and complete the whole quote lifecycle, and at the same time interact with Apttus CPQ products, approvals, and pricing. The quotes are always maintained within the CRM solution. The whole quote process is available as a menu in Excel and more options are made available based on the processing stage. This makes it very much simple for the users to understand where is the actual quote process in its whole life cycle. Ability to send these quotes to the Customers from Excel itself. Quote generation using artifacts that are already stored in your CRM applications. Has the ability to store both structured and the unstructured data inside a CRM application. In this article, we have seen what a CPQ tool is all about and also understood the internals of Apttus CPQ tool. We have also seen how it fares when in comparison with Salesforce CPQ tool. Though it is not a real negative as against Salesforce CPQ, it is a good competitor to Salesforce CPQ - finding its usage in top organizations. We have also seen many more details on this CPQ offering from Apttus explaining in great detail about these processes and the like.